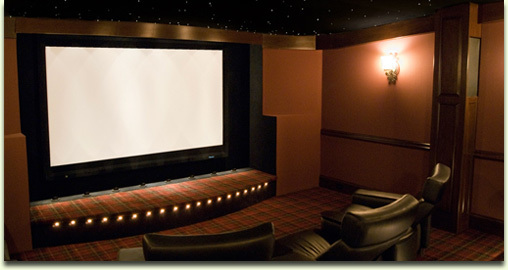 MHS has the right combination of high quality products and expertise to successfully complete any audio installation. Our goal is to put every one of our 35 years of experience to work for you. We specialize in great sound for your home or business. JBL Synthesis speakers and subwoofers custom installed behind the screen, walls, and in decorative columns in our Showroom Theater. Mother is in the kitchen reminiscing with one of her dearest friends. All the while, the room is filled with unobtrusive, yet beautiful background music from a seemingly invisible source. A childhood favorite song comes through the elegantly installed In-ceiling speakers bringing about lots of laughter and a few dance moves. Father is in the study sending the last email of the day when he catches himself humming along to the waltz from Tchaikovsky's Swan Lake. His music and his humming are uninterrupted as he makes his way across the house to the game room. The transformation from Symphony Hall to Sports Stadium is as easy as a single button press. It seems as though he is sitting in the crowd because of the surround sound as tip-off anticipation builds. Meanwhile, Junior and several of his friends are watching the latest Action-Packed thriller in the home theater at volume levels that should be disturbing the neighbors. However, the neighbors, much less anyone else in the house, are not disturbed by the explosions and car crashes because the sound is contained in the theater due to properly engineered acoustic treatments and sound isolation. Whether you require the most sophisticated home theater or simply want to add a couple of speakers in key rooms throughout the house, MHS can design an audio system that fits your needs. For home or business, contact one of our knowledgeable sales staff for specific information about the audio products and services we offer. Also, check out our Gallery for pictures of installations we have completed.